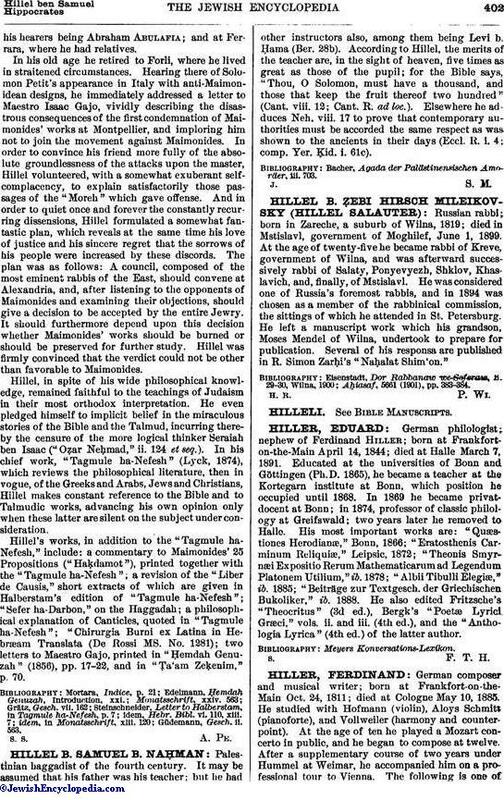 Russian rabbi; born in Zareche, a suburb of Wilna, 1819; died in Mstislavl, government of Moghilef, June 1, 1899. At the age of twenty-five he became rabbi of Kreve, government of Wilna, and was afterward successively rabbi of Salaty, Ponyevyezh, Shklov, Khaslavich, and, finally, of Mstislavl. He was considered one of Russia's foremost rabbis, and in 1894 was chosen as a member of the rabbinical commission, the sittings of which he attended in St. Petersburg. He left a manuscript work which his grandson, Moses Mendel of Wilna, undertook to prepare for publication. Several of his responsa are published in R. Simon Zarḥi's "Naḥalat Shim'on." Aḥiasaf, 5661 (1901), pp. 383-384.